Shaikh Muhammad ibn Hādi has known Al-Maktabah As-Salafiyyah (Salafi Publications) for close to 25 years and he has praised us, individually or collectively, many times over these years extolling our truthfulness, honesty and adherence to the Salafi Manhaj. So, this short article was not written except by one who is well-acquainted with Muhammad ibn Hādi, may Allah guide him and rectify him. Salafi Publications were from the closest of the people to Shaikh Muhammad ibn Hādi, so there is certainly ‘no axe to grind’ or any personal issues between us. We have always mentioned him with good and have been guests at his home too many times to enumerate. He likewise has visited us a few times. He first arrived in Birmingham in 1996, at the age of 30, as a young shaikh who had respect for the elder Scholars; and from those who he respected greatly was Ash-Shaikh Al-’Allāmah Rabee’ ibn Hādi ‘Umayr Al-Madkhali (hafidhahullāh) who was 63 at the time — this highlights the age difference between the two men. As for their knowledge, writings, studies, wisdom, experience and scholarship, then there is no doubt that Shaikh Rabee’ is the Imām and Muhammad ibn Hadi is a younger student in comparison. It is sad that a man who had so much potential has embarked upon a path of his own demise. O Allāh, the turner of the hearts, keep our hearts firm and steadfast upon your Religion. After reading this article, I hope that those who were previously indecisive, confused or even convinced by Muhammad ibn Hādi’s “refutations” and may have held something in their hearts towards other Salafis will see the truth, inshā’-Allāh. They will realise that the Major scholars are correct in their assessment of Muhammad ibn Hādi. I can say in all honesty, and Allah knows best, that anyone who returns back to the truth will not be vilified or ostracised; this is from the advice of our scholars who seek unity and brotherhood between the people of Sunnah. It only brings joy to the hearts of Ahlus-Sunnah when they see a person return to the truth and make amends. I have seen brothers who were initially deceived by Muhammad Ibn Hādi but when the affair was made clear to them, they returned to the truth and were welcomed by Shaikh Rabee’, Shaikh ‘Ubaid, Shaikh Abdullāh Al-Bukhāri and the students of knowledge without any recrimination or bad-feelings. The campaign-group around Muhammad ibn Hādi has used social media to push its agenda, so the fitnah engulfed the Salafis worldwide very quickly leading to differing and discord — but, alhamdulillāh, the scholars clarified and continue to clarify, so that the rifts are mended, and we ask Allah, the Mighty and Majestic, to hasten that for us. NOTE: Please read my additional comments at the end of this article. WHAT DID MUHAMMAD IBN HĀDI ACTUALLY SAY? “The head of evil (ra’s ash-sharr)”, etc. 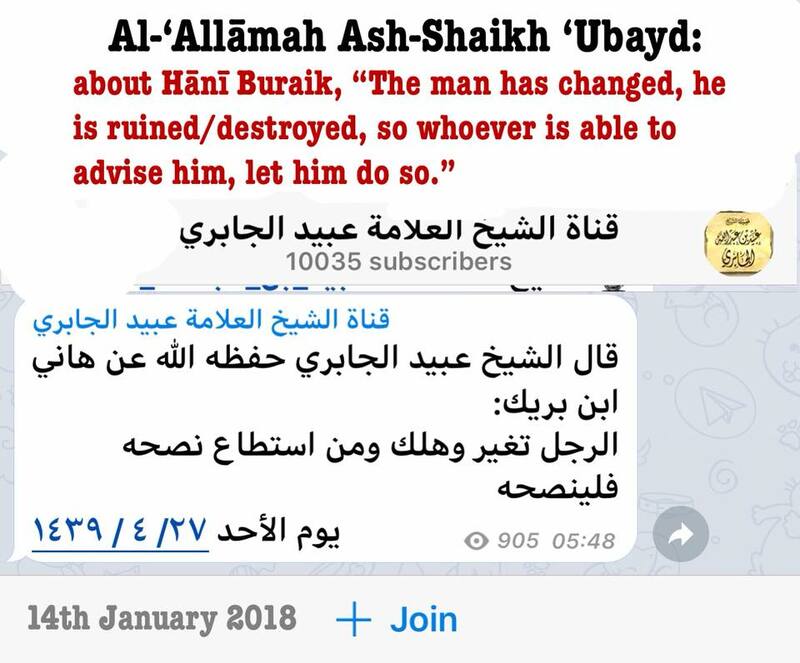 Since that time, Dr Muhammad ibn Hādi has increased in his insulting comments and disrespectful speech and extended them to Shaikh ‘Ubayd, Shaikh Rabee’ and Shaikh Abdullāh Al-Bukhāri. He has not visited either Shaikh Rabee’ or Shaikh Ubayd since then. The first punishment: Eighty lashes. The second punishment: Their trustworthiness (‘adālah) is nullified so their bearing witness is not accepted. The third punishment: They are described as sinful, and that means exiting obedience to Allah. And this is our Religion before Allah, that Muhammad Ibn Hādi should be treated in accordance to scales of the Sharee’ah. And his witness and claims against others should not be accepted since he has, “wasted himself and wasted the knowledge he had due to this fitnah.” A fitnah in truth that he himself ignited after being advised, by the one who is over 30 years senior to him, not to sow discord in the ranks of the Salafis. Ash-Shaikh Al-’Allāmah, Sālih Al-Fawzān was asked: What is the ruling of describing a sinner with terms like, “so-and-so is a fornicator (‘āhir)” or “so-and-so is a fājir”, or “so-and-so is an ‘irbīd”? So, Al-’Allāmah Al-Fawzān answered, “It is not permitted to humiliate a person due to sins, rather it is upon him to advise him and to conceal his sins. The Prophet (salallāhu ‘alaihi wa-sallam) said, ‘Whoever hides [the sins of] a Muslim, Allah will hide [his sins] in this world and the Hereafter.’” (A question after his class, At-Ta’leeq ‘Ala Fathul-Majeed, on Tuesday 3rd Rajab 1439H (20th March 2018) three months after Muhammad ibn Hādi’s lecture). Muhammad Ibn Hādi is aware and knows from the greater scholars (some of whom are 30 to 40 years older than) him such as Ash-Shaikh ‘Al-Allāmah Sālih Al-Fawzān, Ash-Shaikh ‘Al-Allāmah Rabee’ Al-Madkhali, Ash-Shaikh ‘Al-Allāmah Abdul-Muhsin Al-’Abbād, Ash-Shaikh ‘Al-Allāmah Ubaid Al-Jābiree and Ash-Shaikh ‘Al-Allāmah ‘Ali Nāsir Al-Faqīhi (may Allah preserve them) — that their Manhaj and the Manhaj of Ahlus-Sunnah Wal-Jamā’ah in their speech against those who oppose the Sunnah is that they base their refutations on quoting the speech of the opposer; and to make clear its falsehood with proofs from the Quran and Sunnah and to explain where that person has opposed the Salaf of this ummah. Knowledge-based refutations are not based upon revilement, dishonouring and insults, or by inventing terminologies that are unbefitting and devoid of truth, such as labelling anyone who differs with Muhammad ibn Hādi as a “kadhdhāb sa’fooq”, as has become the hallmark of his group. The Salafis are nurtured upon proofs and evidence, not insults, revilement and accusations of fornication. The disastrous path of Muhammad ibn Hādi is made worse when we come to know that his proofs were weak, to begin with, and not grounded in the Salafi Manhaj, and were rejected by the scholars. Muhammad Ibn Hādi sat with ‘Allāmah Rabee’ (hafidhahullāh) on a few occasions before his “breaking the silence” public lecture in which he insulted and spoke unjustly about a group of Ahlus-Sunnah, and Shaikh Rabee’ sternly instructed him not to cause dissension and discord among Ahlus-Sunnah. For this reason, since then Al-’Allāmah Rabee’ has repeatedly stated, “I read everything Muhammad Ibn Hādi presented, word-for-word, and he has no proof whatsoever for his oppression!”  That which Muhammad ibn Hādi described as proof turned out to be vague and false allegations, and certainly not deserving this amount of turmoil and disruption. Since then, much has been written and published refuting and nullifying his baseless accusations. See, for example, the thirteen-part series authored by Shaikh Fawwāz ibn ‘Alī Al-Madkhali entitled, “Fathul-‘Aliyy Lil-Kashfi ‘an Akhtā’i wa Mughālatāt Muhammad ibn Hādi,” which has been commended and approved by the scholars. I remember back in April 2017, a group of us sat with Muhammad Ibn Hādi after he invited us to his home. So, in that gathering, he started to refute these students of knowledge of Madinah and warning us from them with very harsh words. So, I asked him, “Our shaikh, is Shaikh Rabee’ with you in what you say?” He replied, “Yes, Shaikh Rabee’ is with me.” I further asked, “And is Shaikh ‘Ubaid with you?” He responded, “I will visit Shaikh ‘Ubaid soon, inshā’-Allāh, and he too will be with me, inshā’-Allāh.” It turned out that Shaikh Rabee’ (hafidhahullāh) was not with him in what he was saying, quite the opposite in fact. As for Shaikh ‘Ubaid (hafidhahullāh), then Muhammad Ibn Hādi did not visit him and nor has Shaikh ‘Ubaid ever agreed with him in his attacks. So, if someone stands to criticise those who are well-known for the Sunnah, then he needs proofs that are even stronger and even clearer! Even if (just for the sake of argument) some of what Muhammad ibn Hādi claimed had aspects of the truth, then it was upon him to return back to the elder scholars so that they may weigh up the benefits and harms of spreading this speech amongst Ahlus-Sunnah all over the world — and to take their advice. He is not exempt from returning back to major scholars. “And verily this religion of yours is one religion, and I am your Lord, so keep your duty to Me and fear Me. But they broke their religion among themselves into sects with each group rejoicing with that which they have.” So, whilst the Scholars like Shaikh Al-Fawzān, Shaikh Rabee’, Shaikh Ubaid, Shaikh Hasan Ibn Abdul-Wahhāb Al-Bannā and Shaikh Abdullāh Al-Bukhāri work and strive to unite the Salafi ranks and bring the youth together in mutual love and brotherhood, Muhammad Ibn Hādi continues to fan the flames of discord and enmity. Muhammad ibn Hādi’s later claim that his speech does not necessitate tabdī’ belies his clear statements and dealings with those Salafi students of knowledge and shaikhs. Muhammad ibn Hādi’s response was, “No one understands from that speech [of mine] tabdī’ except an ignoramus or a person of desires (sāhib hawā)…” This type of insulting and disrespectful language from Muhammad ibn Hādi no longer surprises us. 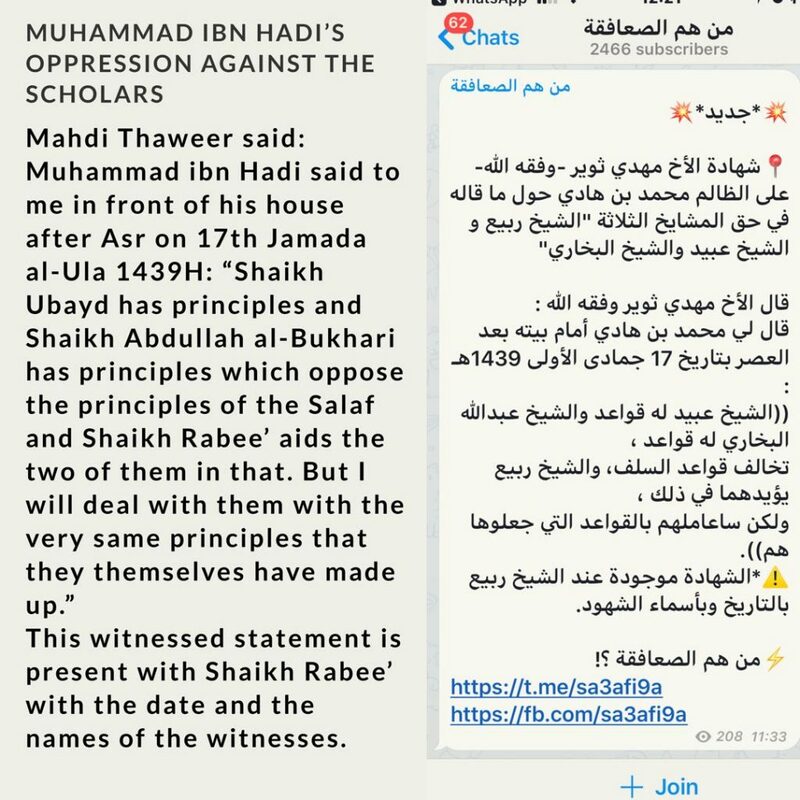 He knows full well that it was the Imām of Sunnah, Shaikh Rabee’ Al-Madkhali (hafidhahullāh) who made that comment concerning him since the article was written by Shaikh Rabee’ and addressed Muhammad Ibn Hādi directly. So, we must ask ourselves the question (as Shaikh Rabee’ asked him), when Muhammad ibn Hādi demands from the Salafis that they are to return to the major, elder scholars (the akābir), who exactly is he referring to?! We at Maktabah Salafiyyah and our brothers elsewhere have been first-hand witnesses to this reality of Shaikh Muhammad Ibn Hādi and we have seen ample proof of his unbefitting conduct in this fitnah. 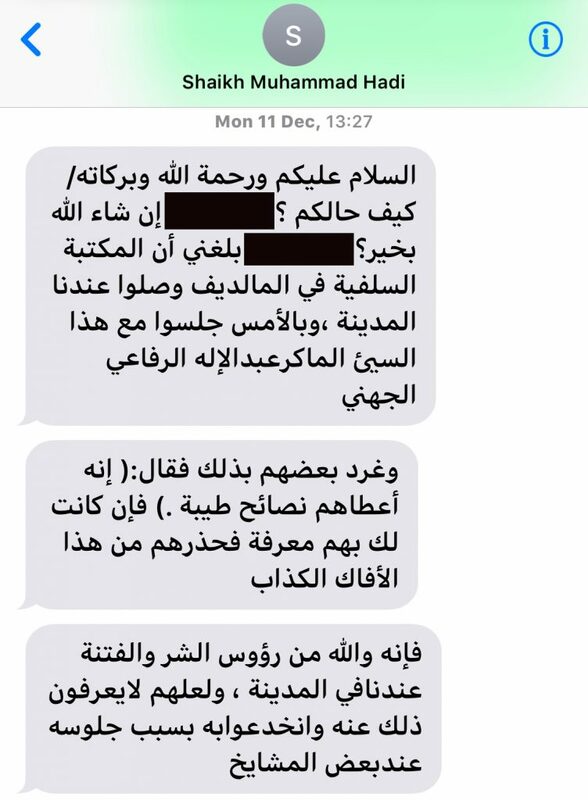 For example, Muhammad Hādi stated in a text message, “It has reached me that the Salafi Maktabah in the Maldives have arrived here in Madinah to us. Yesterday they sat with this evil-doer and schemer, Abdulilāh Ar-Rifā’i Al-Juhani. And one of them tweeted that he had given them some fine pieces of advice. If you have any acquaintance with them, warn them from this untruthful fabricator (affāk) and liar (kadhdhāb). He is, by Allāh, from the heads of evil (sharr) and tribulation (fitnah) with us here in Madinah. Maybe they do not know this, and they are deceived by him due to the fact that he sits with some of the shaikhs.” (See figure 2) These types of warnings and insults have now become a hallmark of Muhammad Ibn Hādi, may Allah guide him. This is, in fact, a defined and detailed jarh (disparagement) upon Muhammad ibn Hādi by an Imām of al-jarh wat-ta’dīl, one of many disparagements based upon proofs. Muhammad Ibn Hādi launched a campaign against individual scholars, shaikhs and students of knowledge with insults, defamation, warning and boycotting — and what he possessed of evidence did not (and still does not) amount to anything that necessitates the hatred, enmity and abandonment that he has engendered in many of the Salafi youth. The fact that Muhammad Ibn Hādi speaks in such a disrespectful manner regarding the scholars did not surprise us due to our experiences with him over the last eighteen months or so. For example, I received a message on Saturday 25th November 2017 that Muhammad ibn Hādi needed to speak to me regarding an important matter. So, I called him, and during this conversation, he informed me that Shaikh ‘Ubaid had opposed the Salafi Manhaj and the ijmā’ of the Salaf in the issue of Hani Buraik; and that Maktabah Salafiyyah should no longer organise durūs and telephone lectures with Shaikh ‘Ubaid. He further added that Maktabah Salafiyyah should remove the lectures and classes of Shaikh ‘Ubaid from their websites. At the time I was in Cardiff, Wales at a conference with Abu Iyād, Abu Hakīm, Hasan As-Somāli, Moosā Richardson, Abu Idrees, Abu Mu’ādh and other brothers. In another call he made a few days later, he informed me that he considered the ‘Ālim, Abdullāh Al-Bukhāri to be alongside the “sa’āfiqah”. In yet another witness statement, the brother, Shaikh ‘Alī ibn Ahmad al-Madkhalī stated, “I swear by Allāh, the Greatest, the Most High, Who raised the heavens without any pillars, that I heard this statement with my own ears. I did not want to spread it because I hoped that he [Muhammad ibn Hādī] would return to the Haqq. Muhammad Ibn Hādī said: ‘Shaykh Rabī’ is surrounded by the Sa’āfiqah and he does not know what goes on around him. As for Shaykh ‘Ubaid, he is worthless and insignificant. He does not amount to a halalah or a fils (i.e. 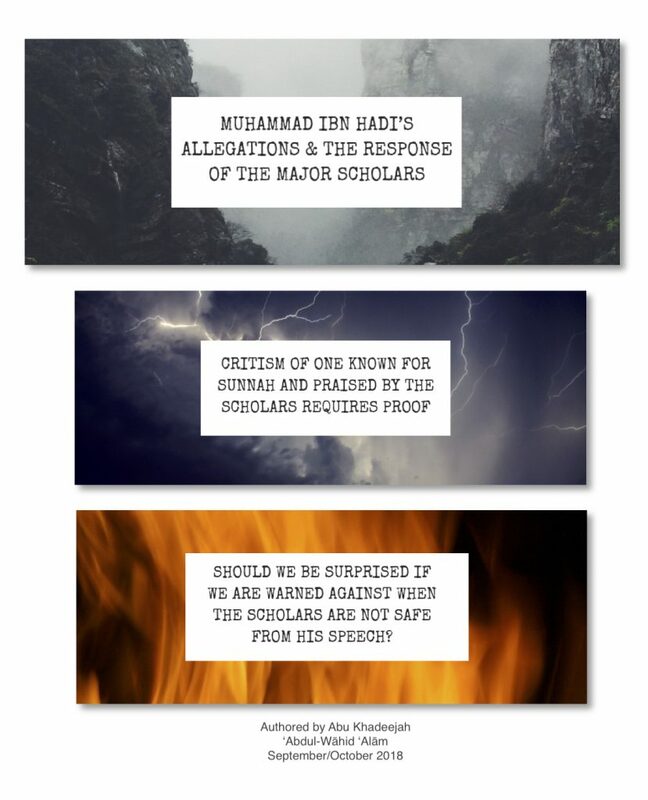 not even a penny)!’” (See figure 3) These statements of Muhammad ibn Hādi are insults and revilements against the scholars of Ahlus-Sunnah wal-Jamā’ah. It is clear that he is overtaken by emotions, and Shaitān has deceived him, and his speech is not supported by any proof that would necessitate this type of vile speech and this amount of tribulation. Muhammad ibn Hādi is quick to revile and attack Ahlus-Sunnah and their scholars, but he himself has blundered several times in some major issues. Muhammad ibn Hādi stated in a recording that is widespread, “The one who abandons actions, as I said to you, whilst that person is able to act, yet he claims that he is a Muslim, and he turns away from performing deeds altogether – and it is said [by people] that he is a Muslim? Then this [saying] is irjā.” In the same audio, he said, “They strike some ahādeeth against others and they take from the ambiguous ahādeeth and abandon the clear-cut narrations. This is from the way of the people of deviation – and we ask Allah for safety and wellbeing.” This speech is a revilement of a body of scholars from Ahlus-Sunnah, such as Ahmad Ibn Hanbal (in a report from him), Ibn Rajab, Al-Albāni and Rabee’ Al-Madkhali. Many of the Haddādi innovators used this speech of Muhammad ibn Hādi to aid their falsehood and to launch further attacks against our Shaikh, Rabee’ ibn Hādi Al-Madkhali (hafidhahullāh). So, Shaikh Rabee’ refuted Muhammad ibn Hādi in a gathering at his house where Shaikh Rabee’ clarified the affair to him with proofs and showed him his error clearly. Muhammad ibn Hādi was not able to respond to any of that, except with, “Who am I to contradict the hadeeth of Allah’s Messenger (salallāhu ‘alaihi wa-sallam) and the sayings of the scholars. I am nothing, I am not even counted.” So, Shaikh Rabee’ requested from him, since Muhammad ibn Hādi admitted his mistake, to repent and retract. Our Shaikh, Abdullāh Al-Bukhāri (hafidhahullāh) suggested to Muhammad ibn Hādi that someone reads to him one of the refutations of Shaikh Rabee’ on the Haddādiyyah in his Masjid revolving around this issue, and in particular the “hadeeth of intercession on the Day of Resurrection”; then Muhammad ibn Hādi could affirm that it is correct, and this would constitute a recantation and would abrogate his previous error. Muhammad ibn Hādi agreed to that, yet till this day he has not recanted. To highlight this error of Muhammad ibn Hādi, I will mention just a handful of the sayings of the Scholars. Ibn Battah (rahimahullāh) said, “A man exits from the level of Imān to the level of Islam, but he does not exit Islam except by committing [major] shirk with Allah; or by outright rejection of an obligation commanded by Allah (juhūd). However, if he abandons the obligations out of neglect or laziness, then he is under the Will of Allah – if He Wills, He will punish him, and if He Wills, he will forgive him.” And similarly is reported from Imām Ahmad. Though the issue [of Imān] can be discussed in much more detail, this is not the place for that discussion. Nevertheless, this point further illustrates the oppression of Muhammad ibn Hādi towards the people of Sunnah. He himself falls into huge errors and gives an opening to the Haddādiyyah to attack Ahlus-Sunnah, so instead of rectifying his errors, he turns his attention to insulting, demeaning and accusing the people of Sunnah. 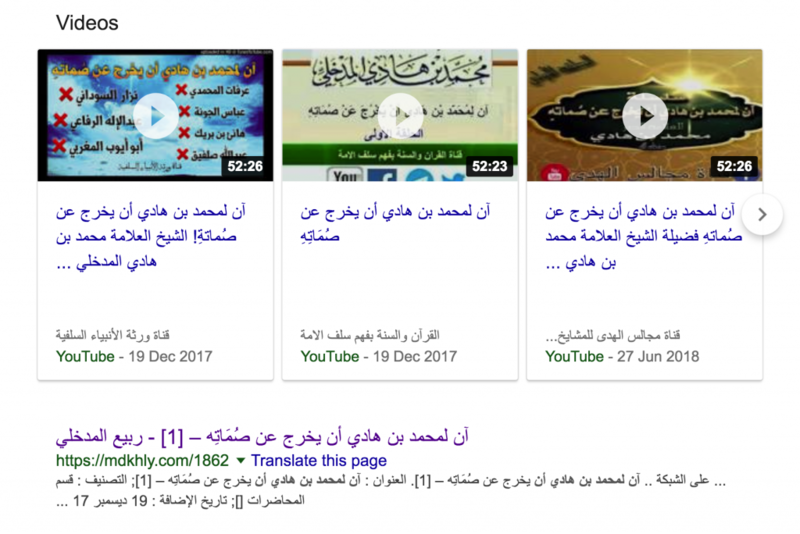 We have seen websites of Ahlul-Bid’ah that have used the direct statements of Muhammad ibn Hādi to revile and attack our Shaikh, Al-‘Allāmah Rabee’ ibn Hādi (hafidhahullāh) and make vile accusations against him! He and his followers have opened the door to Ahlul-Bid’ah and invited them to attack the Salafis, whether they perceive that or not. Shaikh Abdus-Salām ibn Barjis (rahimahullāh) stated : “Ibn Qutaibah (rahimahullāh) said that young ones are those small in age; so he said regarding the narration of Ibn Mas’ood (radiyallāhu ‘anhu), “He intends by this that the people will not cease to be upon goodness so long as their ‘ulamā are the elders, and they not the young ones. This is because the delights of youth have left the elder one; and likewise, his rage and anger are no longer present; nor his hastiness, or foolishness. So, now [in old age] he is accompanied by experience, practice and expertise — and doubts do not enter his knowledge, he is not overcome by desires and he does not incline towards greed. The Shaitān cannot cause him to slip as he causes the younger scholars to slip. So along with [old] age comes composure, dignity, sobriety, reverence and awe. The [blameworthy] affairs that the elder scholar is secure from may befall the younger one! So when they befall him, and then he issues fatawa, he ruins others and ruins himself.”  Shaikh Abdus-Salām also made the point that this is not absolute since there was a group from the Sahābah and Tābi’īn who excelled in their younger years, and they taught and delivered fatwā while the elders were alive. However, they honoured and respected the elder scholars and imāms — and it is important that each person is given the station he deserves and placed in his correct position. This brief discussion should be sufficient for any seeker of the truth to leave alone differing and disputation, to stay away from the hateful, insulting and disrespectful speech of Muhammad ibn Hādi and to cling to elder and major scholars. And we ask Allāh, the Mighty and Exalted, to guide him back to the truth. Translated as, “The time has come for Muhammad ibn Hādi to break his silence.” 19th December 2017 / 1st Rabi Ath-Thāni. Still accessible on the site of Muhammad Ibn Hādi as of 22nd September 2018. After ‘Ishā, 11th of Muharram 1440AH / 20th September 2018 at the house of Al-‘Allāmah Rabee’ (source: Uthmān Sudāni). See Idāhul-’Ibārāt fi Sharhi Akhsar Al-Mukhtasārāt 3/311-312. Adwā Al-Bayān of the Allāmah and Mufassir, Muhammad Amīn Ash-Shinqīti 6/111, see also Majmu’ Al-‘Allāmah Ibn Sa’di 12/58. Tirmidhi 2032, see Sahīh Al-Jāmi’ 7985. Ibn Mājah 4250, Sahīh Al-Jāmi’ 3008. From those present: Abu Hakeem Bilal Davis, Abdulilāh Lahmāmi, Uwais Taweel, Abu Khadeejah Abdul-Wāhid, Hasan As-Somāli and Abu Abdil-Ghafūr. See Sahab.net, 1st March 2018 / 13 Jamāda Al-Akhirah 1439. Abridged to get the point of the Shaikh across. Al-Majmū Al-Wādih Fi Raddi Manhaj wa Usūli Fālih in Majmū Kutub wa Rasā’il wa Fatawa of Shaikh Rabee’ 9/158-159. Narrated by Shaikh Abdullāh Adh-Dhafīri in a document present with the author. See Ta’līqāt ‘ala Ta’ūnāt Ash-Shaikh Muhammad Ibn Hādi, by Al-Allāmah Rabee’ Al-Madkhali, p1. Abdullāh Muhāwish from Makkah witnessed that Muhammad Ibn Hadi declared those he defamed to be non-Salafis. Tele-link with Markaz Abu Bakr As-Siddīq, USA, 15th Safar 1439H (4th November 2017). See manhaj.com article, “Shaykh bin Hādi’s Oppressive Tabdī’” by Abu Iyād for a fuller discussion. Question to the Shaikh by Nāsir Hāmid Al-Kanadi, 25th Dhul-Hijjah 1439. This witnessed statement is present with Shaikh Rabee’ with the date and names of the witnesses. The clarification issued by Shaikh ‘Ali Sayyid Al-Wasīfi and Shaikh Hasan Ibn ‘Abdul-Wahhāb Al-Bannā, 18th Dhul-Hijjah 1439, p.2. See Al-Ibānah ‘an Awhāmi wa Aghālīt mā fil-Kinānah of our brother, Shaikh Abdulilāh Al-Juhani, p.1-2 with the link to the recording. Permission was granted by Al-‘Allāmah Rabee’ to circulate this refutation against Ibn Hādi. Ibid, p.4. And how true is what he said here! At-Takhwīf min An-Nār, p. 259. See ‘Awnul-Bāri 2/926, Shaikh Rabee’s explanation of Sharhus-Sunnah. See Al-Ibānah ‘an Awhāmi wa Aghālīt mā fil-Kinānah of our brother, Shaikh Abdulilāh Al-Juhani. Reported by Ibn Mandah in the Musnad of Ibrāheem bin Adham, pg. 34 and reported by other compilers. See Shaikh Abdus-Salām ibn Barjis’ (rahimahullāh) excellent treatise entitled, ‘Awā’iq At-Talab, p.31. Nasīhatu Ahlil-Hadīth of Khatīb Al-Baghdādi, p. 16. Jazaakullaah khairan Ustadh Abu Khadeejah for compiling this clear cut article. It is sufficient evil that he has slandered the students of knowledge, the shaikhs and scholars (like Shaikh Abdullāh Al-Bukhāri), but even the elder and major scholars are not safe from his speech. Allahul-musta’ān. Additionally, the same argument can be used for Yahyā Al-Hājoori, Ali Hasan Al-Halabi, Abul-Hasan Al-Ma’rabi and Fālih Al-Harbi. All of whom were praised by the scholars, and when they “changed” and opposed the truth, they were refuted. Bārakallāhu feekum. A brother from Canada pointed out a typo in a date, which I have now corrected. I initially typed (by accident) that our sitting with Muhammad ibn Hadi at his house was in April 2018. That was, of-course, a typographical error, and would not make sense chronologically. The sitting at his house with us was actually in April 2017. I have now corrected that in the above article. I just got to understand the whole situation. Thanks for the clarification. JazaakumuLlah khayran. Our beloved teacher Abu Khadeejah Abdul-Waahid Alam, may Allaah preserve him was asked some questions in regards to certain doubts being spread by a few youth who have been duped by the fitnah of the Musa’fiqah. What do we say about those who say brothers are obsessed with Muhammad bin Haadee and make statements such as, “The brotherhood in Birmingham is not strong”? And Allaah’s refuge is sought. Alhamdulillaah, the brotherhood in Birmingham is strong. And it is they who are obsessed and they are ruining brotherhood (for themselves) with their obsessive blind-following and their naive understanding of this issue. Alhamdulillaah, they are only a few (barely noticeable), young in age and confused. They have abandoned the classes that they used to attend – and will not even extend a salaam to us anymore. So this small band are the ones who neglect their brothers and have disowned them. They have abandoned the Salafi conferences and made walaa’ and baraa’ in this fitnah over affairs they have no understanding of. They are inexperienced, young and unknown to the one they defend (Shaikh Muhammad Ibn Haadee) and unknown to the ones they oppose (Shaikh Rabee’, Shaikh ‘Ubayd and Shaikh Abdullaah Al-Bukhaaree). So with what authority (and investigation) do they speak? It is they who blind-follow and don’t understand the etiquette of differing, and those who they follow have caused splits among the Salafis – and they know that and see that with their own eyes but refuse to face up to it. It is they who fish in murky waters and whisper in the shadows without facing us. That is why they refuse to sit and talk with me while they know that we have sat with and spoken with Muhammad Ibn Hadi over this issue on several occasions. Add to that the fact that we have known him for over 20 years personally, and we were beloved to him as he was beloved to us. And we have sat with the Scholars: Shaikh Rabee’, Shaikh ‘Ubaid, and Shaikh Al-Bukhaaree and we are known to them. Additionally, we have sat and spoken with those who were close to Muhammad Ibn Haadee before this fitnah, and then left him due to his harsh conduct and behaviour towards Ahlus-Sunnah and their scholars – such that he considers that they should be treated like Ahlul-Ahwā, warned and abandoned like Ahlul-Bid’ah! We also sat with those who he accuses from the Shaikhs and the students of knowledge (whom we have known for many years), and they are our brothers. So who (in truth) are the ones who speak with knowledge and investigation alongside over 20 years of maintaining close ties with the scholars?! And who is the one obsessed and blindly-following in reality? These youth do not know the principles that necessitate splitting and the mistakes, slips and ijtihaadaat that do not. So who is truly acquainted? The youth who appeared on the scene only yesterday, who learned about this issue through Twitter, Telegram, trolls, rumours and WhatsApp gossip or those who are well-acquainted and sat with the scholars face-to-face and understand the affair from its beginning as it unfolded? So, I extend to them again the opportunity to come and sit, and for them to explain themselves and their stances, and why they think Muhammad Ibn Haadee is correct in his calls for boycotting and warning from Ahlus-Sunnah? There is speech being circulated by the musa’fiqah saying that Salafi Publications were once upon the warnings of Muhammad bin Haadee against the students and shaikhs? How should we reply to these individuals? We never attacked or oppressed, but we did give Muhammad Ibn Haadi his rights; we listened to him, gave him ample opportunity and the chance to clarify and explain – and we investigated the affair thoroughly. After that, we took a stance in line with the proofs (or the lack thereof). We refused to support anyone who reviles the Major Scholars and openly calls for the splitting of the Salafis over affairs that are not established in the principles and foundations of Salafiyyah. This is not what we learned from the likes of Sufyaan Ath-Thawree, Ahmad Ibn Hanbal, Al-Barbahaaree, Ibn Taymiyyah, Ibnul-Qayyim and Muhammad Ibn Abdul-Wahhaab, and nor from other than them from Scholars of Salafiyyah! This is the Tarbiyyah that we have been raised upon for the last 25 years. So, show us the evidence of the corrupted principles of Shaikh Ubaid, Shaikh Al-Bukhaaree and Shaikh Rabee’? Show us where they have been affected by principles that oppose the Salafi Manhaj? And prove to us the basis for this blanket boycotting and warning against a group of Salafis? That is a belittlement of an ‘Ālim of the Sunnah and an Imām of hadeeth. Proving him erroneous with valid evidence is one thing… insulting him is quite another. So, to take the stances of an Imām of Sunnah wherein he is clearly upon the Haqq is to take him as a Prophet!? I fear they will take the same path of the Hajaawirah, the followers of Al-Ma’rabee and Halabiyyoon in opposing Shaikh Rabee’ (hafidhahullaah). Al-Halabi used to say: Shaikh Rabee’ is a noble scholar but he is surrounded by evil company. Thereafter he moved on to belittle and then to refute the Shaikh. So, ask them, when was the last time Muhammad ibn Haadi visited Shaikh Rabee’ or Shaikh ‘Ubaid? Has he shown you proof why Shaikh ‘Ubaid is worthless and why he should be abandoned? And why Shaikh ‘Abdullaah Al-Bukhaaree should not be visited and where the proof is that these scholars have opposed the principles of Salaf? So who, in reality, are the blind-followers? May Allaah guide them, and we ask Allaah for safety and well-being. Baarak Allahu Feek Ustaadh. Currently dealing with issues here in brisbane with regards to this fitnah. Allahul Musta’an!